Introducing Primi Passi – my first pattern! I’m so very excited to present my first quilt pattern to you. This pattern comes from the very first quilts I made for my twin nieces when they were born, almost 20 years ago. I’ve called it Primi Passi, which is Italian for “First Steps” because it represents my first step into quilting as well as the girl’s first steps in life and now my first steps into designing quilt patterns. It is a cot sized quilt, suitable for beginners which uses half square triangles and flying geese. I love the patterns created by the fabric placement; it would look beautiful in solids or printed fabric. You can purchase Primi Passi from my shop here. Please enjoy Primi Passi; there are more patterns in the pipeline so keep an eye out. I can’t wait to see your versions – please use the hashtags #VineLinesFirstPattern and PrimiPassi when posting to social media so I can see them! I’m linking up with Sew Cute Tuesday over at the lovely Alyce’s Blossom Heart Quilts website. Go take a look; there are some gorgeous quilts on show. 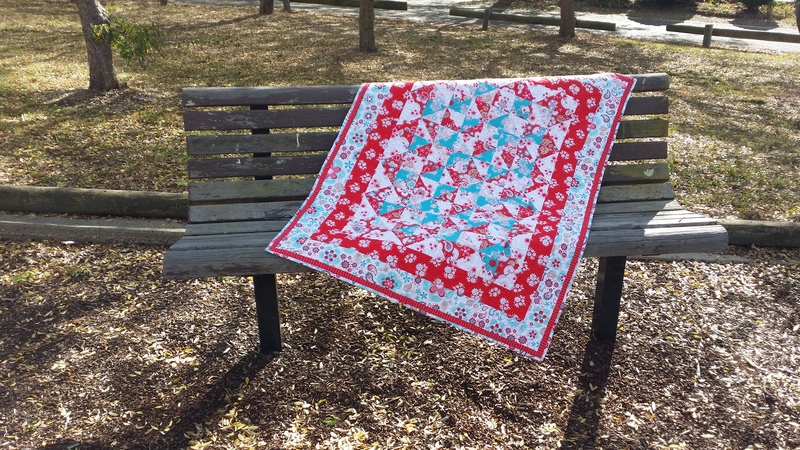 Very pretty quilt and pattern!